Several years ago, David Nieman set out to study racers at the Western States Endurance Run, a 100-mile test of human stamina held annually in the Sierra Nevada Mountains of California. The race directors had asked Nieman, a well-regarded physiologist and director of the Human Performance Laboratory at the North Carolina Research Campus, to look at the stresses that the race places on the bodies of participants. Nieman and the race authorities had anticipated that the rigorous distance and altitude would affect runners’ immune systems and muscles, and they did. But one of Nieman’s other findings surprised everyone. After looking at racers’ blood work, he determined that some of the ultramarathoners were supplying their own physiological stress, in tablet form. Those runners who’d popped over-the-counter ibuprofen pills before and during the race displayed significantly more inflammation and other markers of high immune system response afterward than the runners who hadn’t taken anti-inflammatories. The ibuprofen users also showed signs of mild kidney impairment and, both before and after the race, of low-level endotoxemia, a condition in which bacteria leak from the colon into the bloodstream. Athletes at all levels and in a wide variety of sports swear by their painkillers. 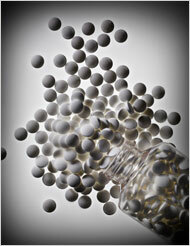 A study published earlier this month on the website of the British Journal of Sports Medicine found that, at the 2008 Ironman Triathlon in Brazil, almost 60 percent of the racers reported using non-steroidal anti-inflammatory painkillers (or NSAIDs, which include ibuprofen) at some point in the three months before the event, with almost half downing pills during the race itself.In another study, about 13 percent of participants in a 2002 marathon in New Zealand had popped NSAIDs before the race. A study of professional Italian soccer players found that 86 percent used anti-inflammatories during the 2002-2003 season. A wider-ranging look at all of the legal substances prescribed to players during the 2002 and 2006 Men’s World Cup tournaments worldwide found that more than half of these elite players were taking NSAIDS at least once during the tournament, with more than 10 percent using them before every match. “For a lot of athletes, taking painkillers has become a ritual,” says Stuart Warden, an assistant professor and director of physical therapy research at Indiana University, who has extensively studied the physiological impacts of the drugs. “They put on their uniform” or pull on their running shoes and pop a few Advil. “It’s like candy” or Vitamin I, as some athletes refer to ibuprofen. Why are so many active people swallowing so many painkillers? One of the most common reasons cited by the triathletes in Brazil was “pain prevention.” Similarly, when the Western States runners were polled, most told the researchers that “they thought ibuprofen would get them through the pain and discomfort of the race,” Nieman says, “and would prevent soreness afterward.” But the latest research into the physiological effects of ibuprofen and other NSAIDs suggests that the drugs in fact, have the opposite effect. In a number of studies conducted both in the field and in human performance laboratories in recent years, NSAIDs did not lessen people’s perception of pain during activity or decrease muscle soreness later. “We had researchers at water stops” during the Western States event, Nieman says, asking the racers how the hours of exertion felt to them. “There was no difference between the runners using ibuprofen and those who weren’t. So the painkillers were not useful for reducing pain” during the long race, he says, and afterward, the runners using ibuprofen reported having legs that were just as sore as those who hadn’t used the drugs. Moreover, Warden and other researchers have found that, in laboratory experiments on animal tissues, NSAIDs actually slowed the healing of injured muscles, tendons, ligament, and bones. “NSAIDs work by inhibiting the production of prostaglandins,”substances that are involved in pain and also in the creation of collagen, Warden says. Collagen is the building block of most tissues. So fewer prostaglandins mean less collagen, “which inhibits the healing of tissue and bone injuries,” Warden says, including the micro-tears and other trauma to muscles and tissues that can occur after any strenuous workout or race.